First, the gorgeous cover. I love the title of the book and associated information in the crest. The barefoot woman running, I assume by the way she's holding her dress up, across a perfect lawn. The dress itself, and the tiara... perfection! Plus small town girl finds out she's a princess, *and* the guy who informs her and needs to convince her to help out the country is the potential love interest? Excellent! Regina Beswick was born to be a princess. But she's content to be a small-town girl, running a classic auto restoration shop, unaware a secret destiny awaits her. One that will leap from the pages of her grandmother's hand-painted book of fairytales. Tanner Burkhardt is the stoic Minister of Culture for the Grand Duchy of Hessenberg. When he is tasked to retrieve the long-lost princess, he must overcome his fear of failure in order to secure his nation's future---and his own. Yet lurking in the political shadows is a fierce opponent with sinister plans to abolish the throne forever. Overwhelmed with opposition, Regina must decide if she's destined to restore old cars or an ancient nation. Together---with a little divine intervention---Regina and Tanner discover the truth of her heritage and the healing power of true love. This book had all the elements of a modern fairy tale. We've got a small-town woman who is smart, armed with strong morals, kind-hearted, friendly and draws people right in. We've got a man with a secret about his past, something he beats himself up over, charged with convincing said small-town woman to leave everything she's ever known to become a princess and dive into a very tense situation in a foreign country. I love to imagine what life would be like if I woke up one day and... suddenly a princess! Regina Beswick apparently grew out of that. Geez. In all honesty, I thought that the way Regina reacts to the news is pretty fair. Though part of me wanted to shake her and say, be just a little bit shallow, allow yourself to indulge a tiny bit, I realize that it would all be so overwhelming. Struggling to find something familiar or to hold onto the past seems like a legitimate first response to having your life turned upside down. The biggest negative to this book was, for me, the religious component, and this is because I wasn't expecting it to have such a strong impact on the story. I'm all for characters turning to whatever they believe in to help them make big life-altering decisions. It seemed quite reasonable to me that Regina would look to her faith for help figuring out whether becoming a princess was really the right path for her to walk. Likewise, Tanner's distance from faith was a conflict that worked for me - his issues with his father, who was not coincidentally an Archbishop, tied into that distance and I thought it was all very well conceived. Unfortunately, things fell apart for me when the Divine started having a more direct hand in things. The ending also comes together very quickly - everything reaches a conclusion a little too neatly for me. Maybe that's my fault again for not embracing the fairy tale idea as fully as possible? 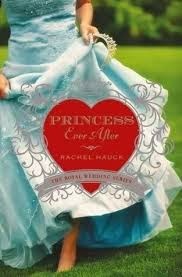 I loved what Princess Ever After was striving for - a story about a small-town woman thrust into a larger-than-life, well, life, trying to find her way, alongside a man suddenly confronting the demons* of his past. It's a modern fairy tale, but relying a little too much on the Divine for my comfort. I'll recommend it, but with the above disclaimer. For fans of contemporary romance, rags-to-sudden-riches stories, christian-themed stories. *Demons might be a little strong.